Several muscles of the thoracic wall, including the most superficial ones that create some of the contours of the thoracic wall, are muscles that act on the upper extremity. Some of these muscles form important surface landmarks on the thorax, and others have relationships to vessels that communicate with the thorax. In addition to moving the upper extremity, some of these muscles also can play a role in movement of the thoracic wall and participate in respiration. The pectoralis major muscle forms the surface contour of the upper lateral part of the thoracic wall (Fig. 4). It originates on the clavicle (clavicular head) and the sternum and ribs (sternocostal head) and inserts on the greater tubercle of the humerus. The lower margin of this muscle, passing from the thorax to the humerus, forms the major part of the anterior axillary fold. The pectoralis major muscle is a powerful adductor and medial rotator of the arm. The pectoralis minor muscle is a much smaller muscle and lies directly beneath the pectoralis major muscle (Fig. 4). It originates on ribs 3-5 and inserts on the coracoid process of the scapula. This muscle forms part of the anterior axillary fold medially. It acts to depress the scapula and stabilizes it when upward force is exerted on the shoulder. The anterior part of the deltoid muscle also forms a small aspect of the anterior thoracic wall. This muscle has its origin on the lateral part of the clavicle and the acromion and spine of the scapula (Fig. 4). It inserts on the deltoid tubercle of the humerus and is the most powerful abductor of the arm. The deltoid muscle borders the pectoralis major muscle. The depression found at the junction of these two muscles is called the deltopectoral groove. Importantly, within this groove the cephalic vein can consistently be found. The muscles diverge at their origins on the clavicle, creating an opening bordered by these two muscles and the clavicle known as the deltopectoral triangle. Through this space the cephalic vein passes to join the axillary vein. The subclavius is a small muscle originating on the lateral inferior aspect of the clavicle and inserting on the sternal end of the first rib (Fig. 4). This muscle depresses the clavicle and exerts a medial traction on the clavicle that stabilizes the ster-noclavicular joint. In addition to these actions, the subclavius muscle provides a soft surface on the inferior aspect of the clavicle that serves to cushion the contact of this bone with structures passing under the clavicle (i.e., nerves of the brachial plexus and the subclavian artery) when the clavicle is depressed during movement of the shoulder girdle, especially when the clavicle is fractured. The serratus anterior muscle originates on the lateral aspect of the first eight ribs and passes laterally to insert on the medial aspect of the scapula (Fig. 5). This muscle forms the "serrated" contour of the lateral thoracic wall in individuals with good muscle definition. The serratus anterior forms the medial border of the axilla and acts to pull the scapula forward (protraction) and to stabilize the scapula against a posterior force on the shoulder. Each rib is connected to the ones above and below by a series of three intercostal muscles. The external intercostal muscles are the most superficial (Fig. 5). These muscles course in an obliquely medial direction as they pass from superior to inferior between the ribs. Toward the midline anteriorly, the external intercostal muscle fibers are replaced by the external intercostal membrane. Deep to the external intercostals are the internal intercostals (Fig. 5). The direction of the internal intercostal muscle fibers is perpendicular to the external intercos-tals. On the posterior end of the ribs, the internal intercostal muscle fibers are replaced by the internal intercostal membrane. Fig. 4. The musculature of the anterior thoracic wall. The left panel shows the superficial muscles intact. The right panel shows structures deep to the pectoralis major muscle. Fig. 5. A lateral view of the musculature of the thoracic wall. Fig. 6. The deep musculature of the anterior thoracic wall viewed from the posterior side. The deepest layer of intercostal muscles is the innermost intercostal muscles (Fig. 6). These muscles have a fiber direction similar to that of the internal intercostals, but form a separate plane. The intercostal nerves and vessels pass between the internal and innermost intercostal muscles. 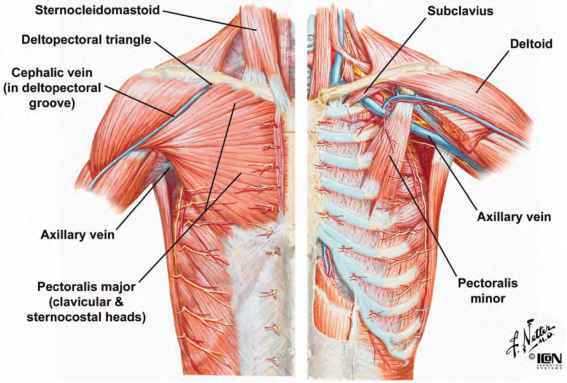 There are two additional sets of muscles in the same layer as the innermost intercostals: the subcostals and the transversus thoracis muscles. The subcostal muscles are located posteriorly and span more than one rib. The transversus thoracic muscles are found anteriorly and are continuous with the innermost muscle layer of the abdomen, the transversus abdominus, infe-riorly. The transversus thoracis muscles pass from the internal surface of the sternum to ribs 2-6. The intercostal muscles, especially the external and internal intercostals, are involved with respiration by elevating or depressing the ribs. The external intercostal muscles and the anterior interchondral part of the internal intercostals act to elevate the ribs. The lateral parts of the internal intercostal muscles depress the ribs. The innermost intercostals most likely have an action similar to that of the internal intercostals. The subcostal muscles probably help to elevate the ribs. The transversus thoracis muscles have little, if any, effect on respiration. The respiratory diaphragm is the musculotendinous sheet separating the abdominal and thoracic cavities (Fig. 7). 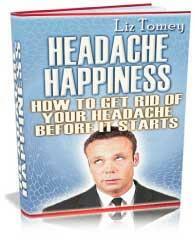 It is also considered the primary muscle of respiration. The diaphragm originates along the inferior border of the rib cage, the xiphoid process of the sternum, the posterior abdominal wall musculature, and the upper lumbar vertebra. The medial and lateral arcuate ligaments are thickenings of the investing fascia over the quadratus lumborum (lateral) and the psoas major (medial) muscles of the posterior abdominal wall that serve as attachments for the diaphragm (Fig. 7). The vertebral origins of the diaphragm are the right and left crura. The crura originate on the bodies of lumbar vertebrae 1-3, their intervertebral discs, and the anterior longitudinal ligament spanning these vertebrae. Fig. 7. The abdominal side of the respiratory diaphragm illustrating the origins of the muscle. The diaphragm ascends from its origin to form a right and left dome; the right dome is typically higher than the left. The muscular part of the diaphragm contracts during respiration, causing the dome of the diaphragm to descend, increasing the volume of the thoracic cavity. The aponeurotic central part of the diaphragm, called the central tendon, contains the opening for the vena cava. The esophagus also passes through the diaphragm, and the hiatus for the esophagus is created by a muscular slip originating from the right crus of the diaphragm. The aorta passes from the thorax to the abdomen behind the diaphragm, under the median arcuate ligament created by the intermingling of fibers from the right and left crura of the diaphragm. The vena cava, esophagus, and aorta pass from the thorax to the abdomen at thoracic vertebral levels 8, 10, and 12, respectively. The scalene muscles and the sternocleidomastoid muscle in the neck also contribute to respiration, especially during deep respiration (Figs. 4 and 5). The scalene muscles have their origin on the transverse processes of cervical vertebrae 4 to 6. The anterior and middle scalenes insert on the first rib and the posterior scalene on the second rib. As its name suggests, the ster-nocleidomastoid has its origin on the mastoid process of the skull and inserts on the medial aspect of the clavicle and the manubrium of the sternum. When contracting with the head and neck fixed, these muscles exert an upward pull on the thorax and assist in respiration. The muscles of the anterior abdominal wall are also involved with respiration. These muscles, the rectus abdominus, external and internal abdominal obliques, and transversus abdominus, act together during forced expiration to pull down on the rib cage and to increase intra-abdominal pressure, forcing the diaphragm to expand upward. 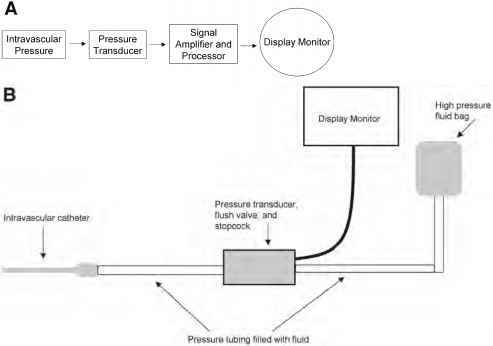 The mechanics of respiration are explained in detail in Section 11.3. What muscles are involved in respiration looking in posterior? 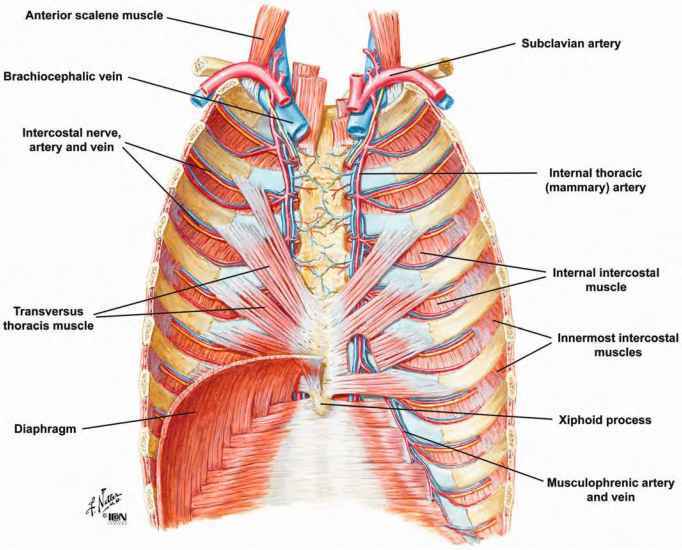 What are the different structures of the muscles of thoracic wall? What are the muscles of thorax? Where is the deep right subcostal? 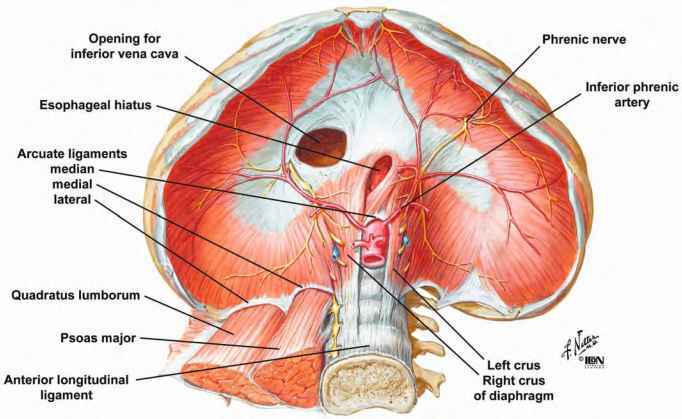 What is diaphragm and its images? 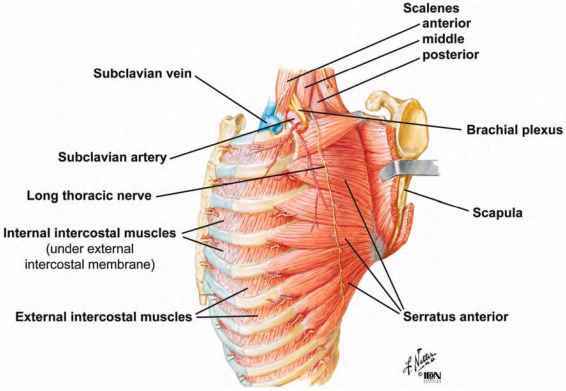 What are the muscles of the anterior thoracic cavity?